Though director John McTiernan has been responsible for some of the most iconic stalwarts of the action genre, including Predator and Die Hard, his 2003 military thriller Basic garnered tepid reviews and a decidedly modest box office take of some $27 million in the US. The film revolves around a group of highly trained US Army Ranger trainees, led by the sadistic Sergeant West (Samuel L. Jackson). A training mission in the waterlogged jungles of Panama goes horribly awry, and West and three soldiers end up dead. Back on base Captain Julia Osborne (Connie Neilson) has little success extracting information from one of the survivors and the resident Colonel decides to bring in the big guns; a former Ranger and experienced interrogator currently under investigation for suspicions of bribery (John Travolta). Together Travolta and Nielson must put aside their differences and piece together a chain of events that grows increasingly sinister as the movie progresses. Most critics responded negatively to the film’s abundance of plot twists and myriad narrative convolutions. I personally can’t fault the film for this; sure it piles on twist after twist until you don’t know what’s what, but it’s an ambitious approach from McTiernan and he is after all just trying to entertain his audience. My problem with the film was the silly, histrionic performances. Travolta minces around like he’s auditioning for a role on Apocalypse Now and Nielson spends most of her time muttering in an bizarre Southern accent or shrieking vitriol for no discernable reason. At one point she slaps an Army doctor (Harry Connick, Jr.) off his chair with a phone book, breaking his nose, then shrugs ‘That was illegal. I’ve got nothing to lose’ by way of explanation. Rather than saying ‘You’re right, that was illegal – I’m going to the military police’, Connick, Jr. breaks down and tells her everything. Silly. Samuel L. Jackson tries his darndest with the material at hand but his character likewise fails to pass muster – any Sergeant that blatantly cruel and sadistic would’ve had a bullet put in his back years ago – and though the actors portraying the Rangers are universally excellent, among them Giovanni Ribisi and Roselyn Sanchez (Rush Hour 2) there are quite a few inaccuracies at play which pointlessly distract from an already complicated storyline. For one thing women aren’t allowed to join the Rangers, so as nice Sanchez is to look at her presence in a jungle bunker with half a dozen testosterone-laden cohorts is absurd. For another they don’t wear berets in a combat or training environment, nor do they shout ‘hoo-ha’ as Sergeant West is constantly admonishing them to do. There probably isn’t an action movie made that doesn’t require at least some suspension of disbelief, but emblazoning a central character’s uniform with the wrong insignia and allowing two characters to trade identities merely by wearing the wrong dog tags is taking liberties even by the standards of the genre. 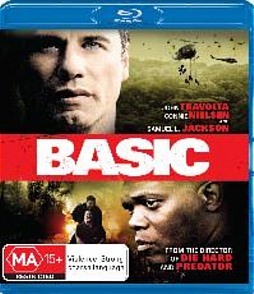 At any rate Basic is a complex, ambitious and often engaging film. It’s also over the top, needlessly contorted and ultimately somewhat unsatisfying. But it certainly has its moments. The Blu-ray release of the film is bare bones, with nary a bonus feature in sight. Both the TrueHD and DTS audio tracks are impressive, but the DTS comes up trumps in terms of resonance and sheer immersion, being a suitably ballsy affair considering the macho subject matter. Picture quality is also pristine, and the film likewise cannot be faulted in this regard. Certainly worth a watch, but the lack of bonus features is a real deficit and ultimately this one is best taken with a grain of salt.